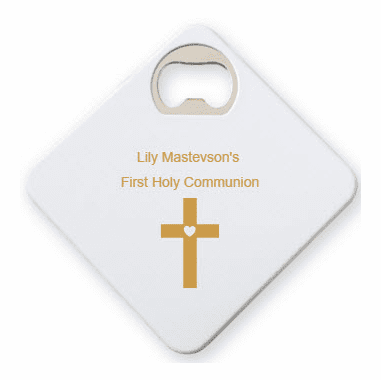 When you think of confirmation or communion favors, personalized drink coasters are not the first thing that comes to mind. However, it will leave a lasting impression on your guests because they will use it each time they want to guard their furniture. It doubles as a bottle opener, so this two-use item will be appreciated. 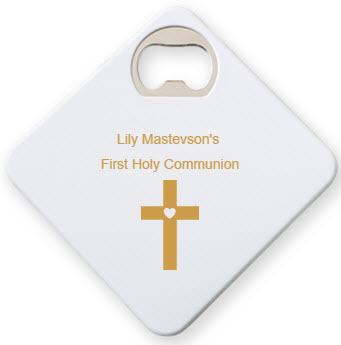 Add a religious graphic and personalized message to tie in the theme of your communion. Made from solid white plastic, coasters measure 3 1/4" x 3 1/4" and have a felt bottom to prevent slipping.